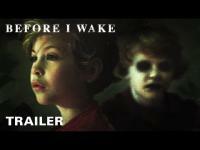 Before I Wake (2016) is a 1h 37-min American supernatural drama fantasy-horror film that I have been anticipating the release of because of the drama and supernatural aspect of the movie. Director and co-writer Mike Flanagan (Oculus (2013), Hush (2016), Absentia (2011)) did an okay job trying to take an overdone topic (creepy child) and make it into something original. The movie overall was mostly an entertaining experience but if the ending was not what it was then the movie could have been an incredibly excellent piece of work. The movie was everything I hoped it would be until the third/last act came about and everything just fell apart. Before I Wake revolves around Jessie (Kate Bosworth - Superman Returns (2006), 21 (2008), Still Alice (2014), Blue Crush (2002)) and her husband Mark adopting Cody who is a foster child after their son Sean dies. Jessie and Mark (Thomas Jane - The Mist (2007), Deep Blue Sea (1999), Dreamcatcher (2003), Face/Off (1997)) discovers that Cody is no ordinary boy. Cody’s (Jacob Tremblay - Room (2015), The Smurfs 2 (2013), Gord’s Brother (2015)) dreams become reality, and he cannot control it. His dreams are sometimes a blessing to the family but can also be deadly at times leaving the couple fearing his dreams that might kill someone if they do not find a solution fast. Cody’s ability/power was somewhat complicated, and Jessie emotion was not of someone who just lost a child in a horrible death but someone who appears to be in a trance. Mark made Cody feel welcomed into their home and was the one that Cody became friendlier with at first. I was not pleased to see Jessie using Cody’s powers/abilities for her own reasons but then again I cannot imagine what she is going through so I cannot judge. Our character’s fate was not revealed which was a big bummer for me as I want to know what happens. I would recommend horror/drama fans to wait for this movie to be on DVD to see it because it is not worth it to pay to see a film with a terrible ending. I gave this movie a six because it was an excellent watch the entertained me for most of the movie and put a few real chills down my spine. The plots, twists, creativity, suspense, elements, sound, special effects and cinematography was amazing but once again, I did not like the open ending. There are not many scares in this film to give horror fans a few jump scares, but the movie achieves in giving its viewers a few chills as Cody’s dreams come alive. Avg. Rating: 3.12/5 stars from 30,364 users.